Blueberries - 3 kg - Snowcrest Foods Ltd.
Blueberries contain health benefiting soluble dietary fiber, minerals, vitamins, and pigment anti-oxidants that contribute to optimum health and wellness. Blueberries are among the highest anti-oxidant value fruits. 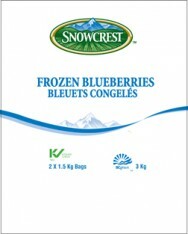 The ORAC value of 100 g fresh blueberries is 5562 TE (Trolex equivalents). Their antioxidant value largely derived from poly-phenolic anthocyanidin compounds such as chlorogenic acid, tannins, myricetin, quercetin and kaempferol. Altogether, the phyto-chemical compounds in blueberries help rid off harmful oxygen-derived free radicals from the body and protect the body from cancers, aging, degenerative diseases, and infections. Research studies suggest that chlorogenic acid in these berries help lower blood sugar levels and control blood glucose levels in type-II diabetes mellitus condition. Blueberries contain small amount of vitamin C, vitamin A and vitamin E. Altogether these vitamins make potent lipid soluble anti-oxidants, help limit free radical mediated injury to body. The berries also contain small amount of B-complex group of vitamins such as niacin, pyridoxine, folates and pantothenic acid. 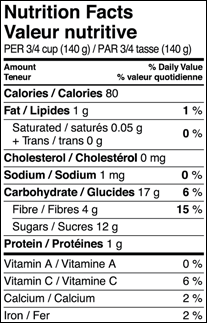 It contains very good amounts of vitamin B-6, niacin, riboflavin, pantothenic acid and folic acid. These vitamins are acting as co-factors help body metabolize carbohydrates, protein, and fats. Blueberries contain good amount of minerals like potassium, manganese, copper, iron and zinc. Potassium is an important component of cell and body fluids that helps controlling heart rate and blood pressure. Manganese is used by the body as a co-factor for the antioxidant enzyme, superoxide dismutase. Copper is required in the production of red blood cells. Iron is required for red blood cell formation.